When it came time to tackle our books, I definitely had some mixed emotions. 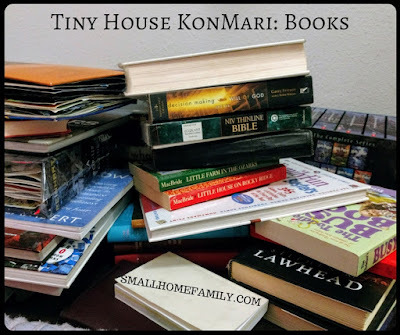 Getting rid of books seems so wasteful to me, and I felt a lot of guilt because many of the books no one loved enough to keep were ones that had been given to us. My mom works for a child care center attached to a private elementary school, and she gets those book catalogs to order from all the time. And she orders from them all the time, but her standards for children's books are much different from mine. One of my college minors was English, and I worked for the head of the English department during my university years, so I spent a great deal of time being exposed to quality literature. I try not to be a book snob, but I do prefer that the books we own to be of a high caliber. 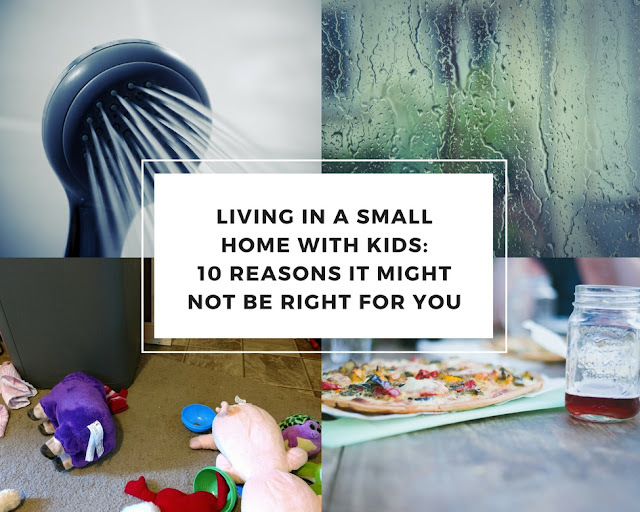 I have no problem with reading (and letting my kids read) wholesome "fluff," but when it comes to making room for books in this little house, I do have higher standards. The library can store the "fluff" books for us. 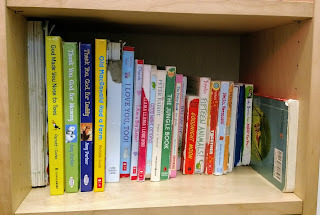 That said, my four-year-old especially has her own standards about what makes a quality piece of children's literature, so we did end up keeping a number of books that I would have preferred to pass along to someone else. I decided to go through our children's books first just because I felt like they were taking over, and I had been feeling that way for quite a while. I did the board books first and then the paper books, and I started this process by myself so that I wouldn't have too many "helpers." After setting aside all the books that sparked joy for me, I let Chris look through the books I was happy to let go. He didn't feel particularly connected to any of them, either. Then I pulled out the ones that I knew my kids rarely asked to read and bagged them up to donate. I did keep a number of books that my kids regularly ask for which I don't love but don't abhor, either. I ended up with a small pile of books that I really didn't want to keep but that I thought Sunshine might be attached to if asked, and just as I anticipated, she insisted that every one of those books made her happy. As a compromise, I put all of those books on a little shelf by her bed, and she can look at them whenever she wants, but they are separated from the books we choose from for our bedtime stories. This arrangement seems to be working for all of us at the moment. She has yet to ask me to read any of them to her. 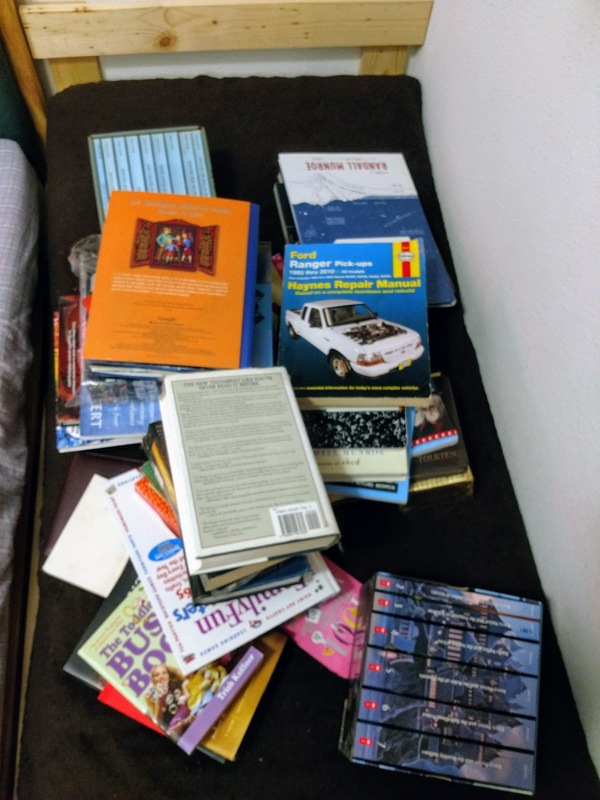 When it came time to sort through the adult books, I collected them all from around the house and piled them on Sweetheart's bed. 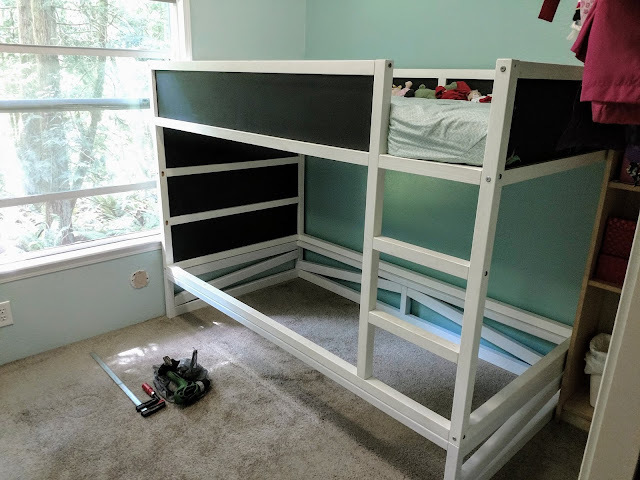 I used a pretty similar method as with the children's books where I picked out all the ones that gave me joy and then let Chris go through what was left. There were a few that he added to my pile to keep. 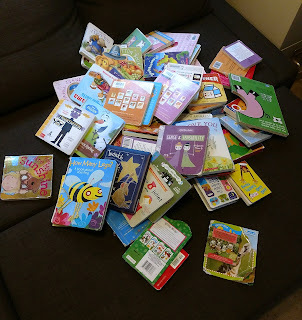 I didn't actually count the children's books, but we had 69 non-children's books in our home, and we chose to keep 52 of those and pass along 17 of them to Goodwill, so we pared our collection down by about a quarter. I had culled a bunch of books within the last year already, so I was pretty amazed that we were able to declutter as many as we did. 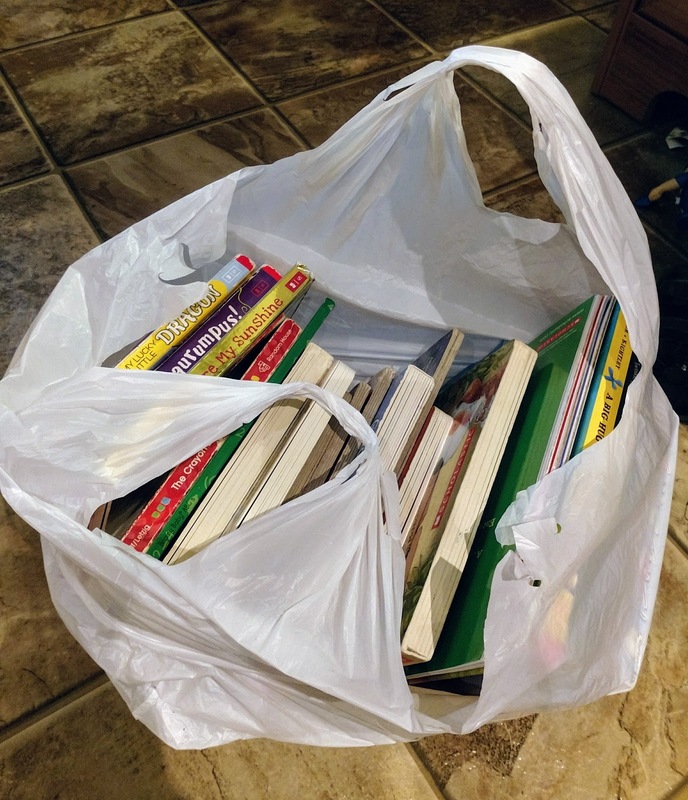 When I began the process of tidying up our book collection, I had high hopes that we would be able to sell some used books to the nearby used bookstore in order to fund more Before Five in a Row books for our homeschool journey, but I quickly discovered that none of the books we wanted to discard were worth anything to anyone else. I wish I would have donated them to our local library for their used book sale, but that didn't occur to me until after they were gone. In the end, I feel so much better about our book situation. 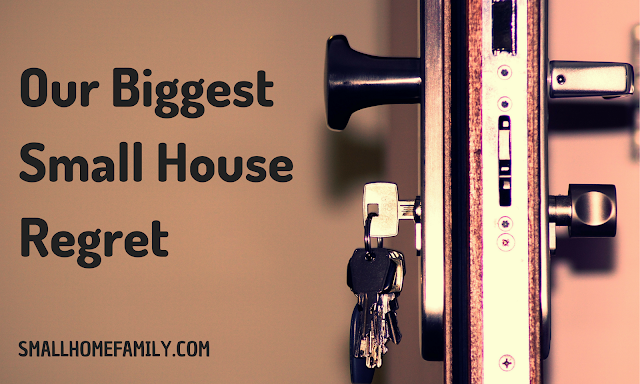 We used to have a board book bin that simply sat on the floor and got dumped out and tripped over all the time, and it was overflowing (as were all the bookshelves), and finding homes for new books was almost impossible. Now, however, everything fits on the shelves that we have, and it's much less stressful to choose books to read at bedtime every night. Getting rid of the "fluff" really makes the good stuff so much more accessible. Tiny House KonMari: Why Tidy?